Containerization or the use of container vans to transport goods began in the Philippines in 1976, a decade after containerization began to take hold internationally. The new method was started by Aboitiz Shipping Corporation when they converted their 1,992-gross ton general cargo ship “P. Aboitiz” into a container carrier. This was followed by the conversion of their general cargo ship “Sipalay” in 1978. These first two container ships had limited capacity in terms of TEU (Twenty Foot Equivalent Unit) which is the common measure of container capacity that can be carried by container ships but it more than showed the direction of cargo loading in the future. And it also showed that general cargo ships can be converted container carriers. By 1978 and 1979, containerization was already in full swing in the Philippines when major competitor shipping companies William Lines Inc., Sulpicio Lines Inc. and Lorenzo Shipping Company also embraced the new paradigm and competed. This new wave was also joined at the same time by two other small and new shipping companies, the Sea Transport Company and Solid Shipping Lines. Except for these two, our pioneers in container shipping were passenger liner (which means there are fixed schedules and routes) shipping companies. The leading liner shipping company then which was Compania Maritima declined to follow suit into containerization along with Gothong Lines while the others like Sweet Lines, Negros Navigation and Hijos de F. Escano followed a little later in the early 1980’s. Gothong Lines, however, was into small ROROs early and these can also load container vans. Sweet Lines later founded a separate cargo-container company, the Central Shipping Company. Like Compania Maritima, Madrigal Shipping, another old shipping company also did not follow into containerization. The smaller passenger liner companies also did not or were not capable into going to containerization. Among them were Galaxy Lines, N & S Lines, Northern Lines, Bisayan Land Transport, Newport Shipping, Cardinal Shipping, Dacema Lines, Rodrigueza Shipping, etc. Soon all of them were gone from Philippine waters and one reason was that they failed to adapt to the new paradigm and shippers were already demanding for container vans. Before the advent of container vans, dry cargo were handled bulk or break-bulk. Bulk is when the whole ship is loaded with grains or copra. But bulk shipment is not possible in the passenger-cargo ships then as major parts of the ship is devoted to passengers and its requirements. Along with passengers, the passenger-cargo ships then carried various merchandise as in finished goods from the city like canned goods, “sin” products and construction materials. On the return trip, it would carry farm products like copra, abaca, rice, corn or dried fish. Since it was mixed, it was called break-bulk. It was mainly handled by cargo booms and porters and stowed in the ships’ cargo holds. Since it was mixed and has no containers aside from boxes the handling was long and tedious and it was vulnerable to pilferage and damage by handling and by the weather. With the coming of container vans the weaknesses of the old way of loading that led to damage and pilferage were minimized by a big degree. Actually, the arranging of the goods was even passed on to the shipper or trader and all the container shipping company had to do was haul aboard the container. The new system needed much less labor (who can be balky at times and disputes with them can lead to delays or intentional damage) than before and the loading is faster because containers can simply be stacked one atop the other. This was difficult with breakbulk because of possible contamination and because the cargo had no containers it was difficulty to simply stack them and this even led to lost cargo spaces. One initial result of containerization was the need for dedicated container ships as the passenger-cargo ships of that era, the cruisers were not meant for the loading of container vans (although they can carry a few and loaded LOLO). Since our local volume was low, our shipping companies preferred not to order purpose-built container ships. Instead, the discovered path was just to convert general cargo ships into container ships. The needed conversion was actually minimal and since these ships were already equipped with cargo booms then it was easier for everything. Only, the booms needed to be more stout as in it has to have more lifting capacity because of the added weight of the steel of the container van. Container vans were handled LOLO or Lift-On, Lift Off. With the coming of ROROs with its ramps and car decks starting in 1980, cargo handling became easier. Break-bulk cargo especially the heavier ones can now be handled by the forklifts and transferred to the car decks (which then became cargo decks also but not as cargo holds). Shipping companies have used forklifts before but mainly just in the ports. Now, the first ROROs also carried forklifts in the car decks and the stowing of container vans in the car decks of the ROROs began. These were mainly XEUs (Ten-Foot container vans) which can easily be handled by medium-sized forklifts. Still many of cargoes in the first ROROs were break-bulk. Some liners of the 1980’s had cargo booms at the front of the ship while having RORO ramps at the stern like the “Zamboanga City” and the “Dona Virginia” of William Lines. It carried container vans at the front of the ship and those were handled LOLO while at the stern they loaded container vans. 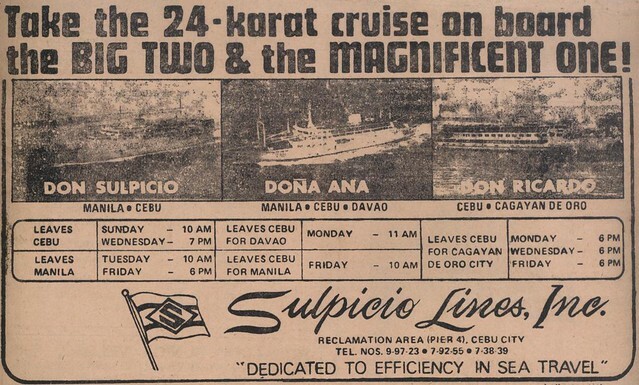 Actually, some big cruiser liners of the late 1970’s can carry container vans on their upper decks at the stern like the “Don Enrique” and “Don Eusebio” of Sulpicio Lines, the “Cagayan de Oro City” of William Lines and the “Don Claudio” of Negros Navigation”. It was handled LOLO by the cargo booms of those ships. At the tail end of the 1970’s and at the start of the 1980’s what was prominent was the race of the leading liner shipping companies to acquire general cargo ships and convert it to container ships. Aboitiz Shipping Company was the early leader and they fielded thirteen container ships between 1976 and 1989. Their series was called the “Aboitiz Concarrier” and latter additions were called the “Aboitiz Superconcarrier” and “Aboitiz Megaconcarrier”. William Lines rolled out in the same period eight container ship plus two Cargo RORO ships which can also carry passengers. They named their series as the “Wilcon”. Sulpicio Lines was not to be outdone and they fielded fourteen and these were dubbed as “Sulpicio Container” or “Sulcon”. In the same period, Lorenzo Shipping, a former major, also rolled out eleven container ship in a series called “Lorenzo Container” or “Lorcon”. Some of these were former general cargo ships of theirs. Sea Transport Company were also able to field eight with place name of their ports of call followed by “Transport” like “Davao Transport”. None of the other liner shipping companies which followed into containerization like Sweet Lines and Negros Navigation had half a dozen container ships. Instead, they began relying on their new RORO ship acquisitions but that was also done by Sulpicio Lines, William Lines, Aboitiz Shipping and Gothong Lines. The main effect of the rush to acquire container ships was the slowing down of the acquisition of passenger ships. Actually, this might even had an effect on their purchase of RORO passenger OR ROPAX ships. With the collapse of many shipping companies in the crisis decade of the 1980’s, this resulted in a lack of passenger ships at the end of that decade. But there were many container ships as in about sixty and that fleet pushed many shipping companies in the cargo trade out of business in the 1980’s. Two main factors pushed them into the precipice – the economic crisis which made it hard to acquire ships and the loss of patronage because the paradigm in cargo handling had changed. Break-bulk was now already marginalized and frowned upon. Shippers and traders have had enough of pilferage and goods damaged in transit. With marginalization, the other cargo liner companies had more difficulty filling up their cargo holds. Voyages became fewer and sailing times ballooned. They became dead duck for the container vans loaded into the fast RORO liners which had fixed schedules. Soon they were on the way out or they had to move to tramper shipping where there are no fixed routes and schedules. During this period cargo liners were even included in the schedule boards of the passenger liners. Their only deficit compared to passenger liners was as cargo ships they had less speed. And since cargo is handled LOLO they also spent more time in the ports. Now, long-distance break-bulk shipping is almost gone. It is only lively now in the regional routes like the routes originating from Cebu and Zamboanga. In many cases, places and routes they have already evolved into intermodal shipping – the use of trucks which are loaded into short-distance ROROs. In this mode the trucks are the new “containers” or “vessels”. Since that is in competition with container shipping, it is now container shipping which is beginning to be marginalized by the intermodal truck especially if it is supported by the cheap Cargo RORO LCT. When the deadly-for-shipping decade of the 1980’s ended (technically, it ended only at the end of 1990), we still had a few former FS ships sailing. Maybe it was because we really lacked ships them and getting loans was really difficult and interest rates were very high. Maybe, the penchant of Filipinos to squeeze the last ounce of life from mechanical things was also a factor. We are also sentimental in letting go of things that have served us for so long. One of the last former FS ships still sailing then was the MV Edward of William Lines. The ship was running the short Manila-Tilik (Lubang Island) and Manila-San Jose (Occidental Mindoro) routes. She is running this route but at times it is another former FS ship, the MV Don Jose I, which is in that route. However, it is the MV Edward which is remembered more in the big town of San Jose. She was actually the last on the route, too. This route is a steel-hulled ferry monopoly at that time by William Lines Inc. after other liner companies withdrew or were gone from shipping. They were also able to block the entry of a new competitor. Beside the steel-hulled ferry there were also wooden motor boats (the batel) plying the route but they concentrated on cargo and do not have very regular schedules (it will depend on how full they were and also on the weather). In 1992, with the coming of the new administration of President Fidel V. Ramos and his call for shipping modernization, there seems to be a sudden realization by the shipping companies still sailing former FS ships that they finally have to go. There were just a few former FS ships still sailing then and their lives were prolonged by retiring other FS ships and cannibalizing them for parts. Their ranks was also further diminished by the very strong Typhoon “Mike” (Typhoon “Ruping”) that visited Cebu in November 1990 which was very deadly for Cebu shipping. Instead of acquiring a new ship for the Manila-Tilik and Manila-San Jose routes, William Lines instead decided to withdraw from the route. But, instead of holding on to their residual rights on the route, William Lines instead welcomed and helped a successor in the person of Dr. Segundo Moreno who was previously not in shipping. Dr. Moreno established the shipping company Moreta Shipping Lines and he purchased the MV Ariake Maru No. 6 from Japan. With this changeover, San Jose and Tilik was able to re-establish their regular connection to Manila. This was important as they were dependent on the national capital for manufactured goods and Divisoria and Navotas were the main markets for their agricultural and sea products. Unlike the former FS ships, MV Ariake Maru No. 6 is a RORO (Roll-on, Roll Off) which means she can load vehicles. Even when used in break-bulk cargo, her main use, a RORO is easier to load and unload and forklifts ease the operation especially in handling heavier cargo. It also means a RORO is less dependent for the services of manual laborers, the porters. MV Ariake Maru No. 6 was actually not bigger than the former FS ship she was replacing but a RORO has a taller cargo deck. MV Ariake Maru No. 6 has the permanent ID IMO 7632307. She was built by Hayashikane Shipbuilding & Engineering Company in their Nagasaki shipyard in Japan in 1977 for Ariake Ferry. She measured 54.0 meters by 12.8 meters with a Gross Tonnage (GT) of 695, which are all about the same as an FS ship. However, her DWT (Deadweight Tonnage) of 284 tons was way less than the 711 tons of MV Edward, a lengthened FS ship measuring 62.9 meters by 9.8 meters. She was equipped with two Niigata diesel engines with a total of 2,400 horsepower. Her original top speed in Japan was 13.5 knots. Arriving for Moreta Shipping Lines, she was renamed the MV Nikki and she was converted into an overnight ferry equipped with bunks with a local passenger capacity of 440. She was two-class ship: an airconditioned Tourist with free linen and pillow and a better toilet and bath and an open-air Economy with no free “beddings” (linen). She was considered by her passengers to be more comfortable than the former FS ships she was replacing. As to speed, she was not faster than the former FS ships which only had less than ½ of her engine power at 1,000 horsepower. Maybe her lack of speed was due to what I heard that she has a spoon hull. That means the design of her hull is similar to a bathtub. Maybe in Japan she was only used for very short-distance routes where the shape of the hull will not matter. Incidentally, this hull is similar to the hull of the barges and LCTs. Assigned to the 120-nautical mile Manila-San Jose route she can’t meet the promised 12-hour sailing time especially when swells are around. Two years after fielding, she settled on a 14-hour sailing time for her route. So sailing at 6pm means a stomach already looking for food once one disembarks. In Moreta Shipping Lines, the Tilik and San Jose routes destinations were also split into separate routes. However, when the MV Kimelody Cristy arrived for Moreta Shipping Lines in 1994, MV Nikki became a dedicated Tilik (Lubang) ship. There her lack of speed did not matter as Lubang island is just a short distance from Manila. A 10pm departure to that port is already assured of a dawn arrival. Moreta Shipping Lines and MV Nikki did good sailing for about a decade or so. But in due time, their Mindoro routes were slowly taken over by the intermodal trucks and buses that was using the short Batangas-Abra de Ilog (Occidental Mindoro) route. As always, the advantage of the intermodal were 24-hour departures and direct delivery to the particular towns or barrios. With such changes, Moreta Lines had to develop other routes and they tried the Panay island routes abandoned by WG&A. But soon, they found out there was nothing much left there and the intermodal was already ascendant there, too. The staple route of Manila-Tilik by MV Nikki was affected in another way. Slowly, the motor banca to Lubang from Nasugbu in Batangas became a competitor. With a combined bus and banca, daytime trips became possible with direct disembarkation (unlike the RORO which only dock in Tilik port). The syndrome was much like how the motor banca drove out the RORO in Puerto Galera. Tilik port is not located in either town of Lubang or Looc and the local road was not good either. By the last half of the 2010’s, the ships of Moreta Lines were barely sailing. At times, only one of their three ferries might be sailing. Reading the writing on the wall, they started cargo shipping in 2009. Not long after, they decided to get out of passenger shipping altogether, sold their passenger ships and used the proceeds to acquire more cargo ships. They then became a pure cargo shipping line (this trying to survive as a shipping line was one characteristic missing in their benefactor William Lines Inc. which decided to go down quietly). MV Nikki came to Medallion Transport in 2012 which was soon followed by the MV Love-1 of Moreta Shipping Lines also. The two ships were used by Medallion Transport to develop new Medallion routes between Cebu and Leyte together with two other ships (always less one because one is used in Masbate). In Medallion Transport, the MV Nikki was renamed to MV Lady of All Nations and she was used to grab traffic from a competitor in the Cebu-Bato route. Medallion Transport was already sailing this route before but they were just shoehorning short-distance ferries in this overnight route (it has also day trip on the reverse). With the fielding of MV Lady of All Nations, Medallion Transport finally had a true overnight ship in this route, their pioneer route to Cebu from their original home port of Bato, Leyte. MV Lady of All Nations is still the Medallion Transport mainstay in the Cebu-Bato route. The competition is suffering because it is using single-class cruisers (admittedly, they are faster, however). Meanwhile, Medallion Transport retrofitted MV Lady of All Nations to have Cabin class and Deluxe class (which approximates the Suite class). So, she is now a four-class ship. Five, if the Sitting Economy, a Cebu-Leyte and Cebu-Bohol fixture is included. Her fares starts at P245 per person which is very cheap for a 55-nautical mile distance. Actually, the Cebu-Bato route is known for having the cheapest fares between Cebu and Leyte. The Tourist fare of Ormoc will actually be already Cabin class in MV Lady of All Nations. In her last drydock in 2014, two years after coming to Medallion Transport, the MV Lady of All Nations spent some time in Star Marine Shipyard in the shipyard row of Cebu in Tayud off Cansaga Bay and the one nearest to the Cansaga bridge. I heard included in the works done in her were upgrading in the engines. It seems it showed as after the drydocking, the MV Lady of All Nations became a faster ship. She does two departures in a day and this means much more revenues for a medium-distance regional ferry. As such, she approximates in the a day a sailing distance from Cebu to the likes of Surigao, Dapitan, Dipolog, Iloilo, Masbate, Calbayog or Catbalogan. At nighttime, she leaves Cebu for Bato arriving there at dawn. She leaves at mid-morning in Bato to arrive in Cebu at mid-afternoon. She is the favorite there since she a bigger and more comfortable ship than her competition. It seems it will be a long time before the competition will come out with a ship that will displace her in the Cebu-Bato route. Her main competition are actually the slightly better ships to Hilongos, another port north of Bato and on a parallel competing route to Cebu-Bato route. Maybe that was the reason why Cabin and Deluxe were added to her since the ships in Hilongos have Cabins and Suites. However, with slightly lower fares and the advantage of a shorter distance to the Southern Leyte towns, she has competitive advantages of her own. And with the short distance to Leyte her speed is not that much of an issue and being nearer to the farther destination then that cancels out the speed disadvantage (but this is not applicable to a very slow ship of a competitor in the Hilongos route, a cousin of theirs). Acquiring her seems to be a genius stroke for Medallion Transport. She is a definite asset for the company. What a definite change of fortune by being a castaway in another route that lost (well, that is also true for MV Lady of Love – an advanced preview)! The start of decades are many times an opportune way to take stock of things. Many countries do that by holding their censuses and we likewise do that. I want to focus on the year 1990 because the decade previous to that was very difficult and dangerous for the country and the economy. That decade was marked by many crises and turmoils and as a result our economy suffered tremendously. Economically and financially, the 1980’s was our second worst decade in the last century after the 1940’s in which World War II occurred. In that war decade, we were subject to invasion, occupation and devastation and our economy therefore shrank. The crisis decade of the 1980’s was calamitous to our shipping. In terms of damage, it was even worse compared to the 1940’s. After the war, the United States of America (USA) replaced our ships that they requisitioned for the war (and which were lost). Later, Japan also paid reparations for the shipping damages they caused, in terms of new ships and soft loans, among other goods. In the 1980’s, we had none of such free replacements and we were not able to recover the wealth pillaged by the Marcos dictatorship. Our peso also lost so much value that acquiring ships became very difficult (in fact we can’t even buy new ships anymore unlike before). And that difficulty was reflected in the size and quality of our shipping fleet. At the start of 1990, our biggest shipping company in the previous three decades, the Philippine President Lines or PPL (they also used the company United President Lines or UPL) was practically dead already. They were just acting as shipping agents and they were no longer sailing ships. And then their main rival in size, the Galleon Shipping Corporation which was a crony company was already bankrupt even before the end of the 1980’s. Another company of similar size, the Maritime Company of the Philippines/Maritime Company Overseas, the ocean-going company of Compania Maritima quit shipping at the middle of the 1980’s. These three companies, our biggest, were all in the foreign trade. The ships of these three companies which were mainly chartered from the National Development Corporation or NDC (a government-owned and controlled corporation) were all seized by or returned to the Philippine Government. Those were then sold one by one to international buyers at bargain prices. These three ocean-going companies all had well over 100,000 gross tons of ships in their fleet, a size only a very few reached in all our decades of shipping. Another shipping company that was once big, notable and well-connected, the American-owned but Philippine-based Luzon Stevedoring Company (LUSTEVECO) also went under. But this has a myriad of reasons aside from the crisis of the early 1980’s and that included the end of the so-called “Parity Rights” (where Americans were given business and commercial rights in the Philippines as if they were Philippine nationals and they can repatriate profits to the USA 100%). This was due to the Laurel-Langley Agreement taking effect in 1974. This company was practically broken up (under pressure, some said) and its assets and ships went to different companies including the Philippine Government which then passed on its assets to its government-owned shipping companies like the Philippine National Oil Company or PNOC. Our biggest inter-island shipping company for nearly 90 years, the Compania Maritima which has Spanish origins and which started when Spain was still ruling the Philippines was also gone by the mid-1980’s. They quit at the height of the political and financial crisis then when everybody was panicking and many companies were going bankrupt or otherwise illiquid. The owners, the Fernandez brothers who were dual citizens packed up their bags and headed back to Spain (and to think one of them was a former Senator of the Republic!). 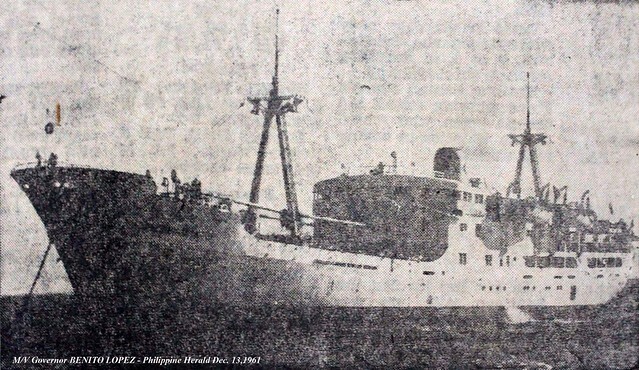 Compania Maritima was so big – aside from local ahipping they also had an international shipping line (the Maritime Company of the Philippines/Maritime Overseas Company as mentioned before) plus they owned ports and they had stevedoring and forwarding operations. A host of our smaller shipping lines with foreign routes also went belly up or quit in the 1980’s. These included General Shipping Corporation, Northern Lines Inc., Transocean Transport Corporation, Philippine Ace Shipping Lines, Philippine Transmarine Carriers, Triton Pacific Maritime Corporation, etc. Actually, so many (as in about three dozens) of our big freighters, refrigerated cargo ships and bulk carriers owned by the National Development Corporation that were chartered to Philippine shipping companies doing overseas routes (especially Galleon Shipping Corporation, Philippine President Lines/United President Lines and Maritime Company of the Philippines/Maritime Company Overseas) were broken up in the 1980’s because they were no longer sailing. About the same number were also sold to foreign shipping companies and usually at bargain prices. The decade of the 1980’s witnessed the practical end of our ocean-going fleet and after that we only had half a dozen ships remaining doing foreign routes and those were mainly below 100 meters in length. This is far from a complete list as there were many regional shipping companies which went down quietly and it is hard to enumerate them all for many are indistinct. In the liner front, two old liner companies were no longer carrying passengers at the start of 1990. These were the Escano Lines, a pre-World War II shipping company and Lorenzo Shipping, a spin-off of the old Carlos A. Go Thong & Company. Both decided to just stick to cargo and container shipping. Maybe refleeting for passenger service with liner ships was already too much for them after that crisis decade of the 1980’s. William Lines and Sulpicio Lines seem to have been the healthiest and definitely the biggest strongest at the start of 1990. Among the shipping companies they were in the best position to take advantage of the fall of erstwhile leader Compania Maritima and the retreat of Lorenzo Shipping and Escano Lines from passenger shipping along with the withdrawal and dissolution of many other various shipping companies in the 1980’s because the two truly had national routes unlike the other liner shipping companies. William Lines Inc. had nine liners at the start of 1990 and that included two old former FS ships still surviving. Their liners were the Dona Virginia, Manila City, Ozamis City, Cebu City, Tacloban City, Misamis Occidental, Masbate I, Don Jose I and Edward. The last two were ex-FS ships on their last legs. Their overnight ferry was the Iligan City, a former liner then just doing the Cebu-Iligan route. They also had two RORO Cargo ships that can take in passengers and these were the Wilcon I and Wilcon IV. Their other container ships were the Wilcon II, Wilcon III, Wilcon V, Wilcon X and Wilcon XI. Sulpicio Lines Inc. had eight liners and these were the Filipina Princess, Philippine Princess, Davao Princess, Don Eusebio, Cotabato Princess, Surigao Princess, Cebu Princess and Dona Susana. Their overnight ferries were the Nasipit Princess, Cagayan Princess and Butuan Princess. Their container ships were the Sulpicio Container II, Sulpicio Container III, Sulpicio Container IV, Sulpicio Container V, Sulpicio Container VI, Sulpicio Container VII, Sulpicio Container VIII, Sulpicio Container IX, Sulpicio Container XI, Sulpicio Container XII and Sulpicio Container XIV. Aside from liners, Sulpicio Lines had more ships than William Lines in the other categories (overnight ferries and container ships). Sweet Lines Inc. had six liners at the start of 1990, the Sweet Baby, Sweet RORO 2, Sweet Glory, the second Sweet Sail and Sweet Hope. Their liner Sweet RORO I was no longer running reliably then and would soon be broken up. Their overnight ships were Sweet Pearl, Sweet Hope, Sweet Marine, Sweet Heart, Sweet Home and the second Sweet Time which sailed Visayas-Mindanao routes. They had a separate cargo-container liner company then which was the Central Shipping Company with the ships Central Mindoro, Central Visayas, Central Cebu and Central Bohol. Another cargo shipping company they had was the Casas Navigation Corporation with the ship Casas Victoria. Aboitiz Shipping Corporation had three old liners then, the Legazpi, Ormoc and Legaspi 1 (the former Katipunan of Escano Lines) and these were just sailing their two remaining liner routes to Capiz and Leyte. They had four overnight ships, the Elcano, Ramon Aboitiz, the first Aklan, and the ex-FS ship Picket II, which were all old, former liners in their last legs. They also had the Marcelino, an ex-FS ship and Guillermo in the subsidiary Cebu-Bohol Ferry Company. Aboitiz Shipping Corporation had the most container ships locally with twelve: the Aboitiz Superconcarrier I, Aboitiz Superconcarrier II, Aboitiz Superconcarrier III, Aboitiz Megaconcarrier I, Aboitiz Concarrier I, Aboitiz Concarrier II, Aboitiz Concarrier IV, Aboitiz Concarrier VI, Aboitiz Concarrier VIII, Aboitiz Concarrier X, Aboitiz Concarrier XI and Aboitiz Concarrier XII. Container shipping was the strength of Aboitiz Shipping because they concentrated on this when for 14 years they did not buy any liners, the reason their liner fleet wilted. Negros Navigation Company had five liners sailing then, the Sta. Florentina, Sta. Ana, Don Julio, Don Claudio and Sta. Maria. These were just sailing five routes then – Romblon, Roxas City, Iloilo, Bacolod and Cagayan de Oro. They also had two Iloilo-Bacolod ferries, the cruisers Don Vicente and the Princess of Panay which was a former liner. This shipping company also had four cargo/container ships, the San Sebastian, Connie II, Aphrodite J and Athena J. The last two were local-built cargo ships. Carlos A. Gothong Lines Inc. (CAGLI) had three liners then, the Our Lady of Fatima, Our Lady of Lourdes and the Our Lady of Guadalupe. Their overnight ships on Visayas-Mindanao routes were the Our Lady of Mt. Carmel, Dona Cristina, Don Calvino, Dona Lili, Don Benjamin and the RORO Cargo ship Our Lady of Hope, their only cargo ship. Together with Sweet Lines and Trans-Asia Shipping Lines, CAGLI was the dominant Visayas-Mindanao regional shipping company at the start of 1990. Madrigal Shipping Corporation, a very old shipping company with pre-World War II origins was then attempting a comeback in liner shipping with the cruiser liners Madrigal Surigao and Madrigal Tacloban (but these were registered with the Cortes Shipping Company of Zamboanga which I never heard of). With the routes they were sailing they were, in effect, the partial replacement of the abandoned passenger routes of Escano Lines because they sailed the same routes. By this time, Madrigal Shipping had already shorn off their old liners, cargo ships and routes. They, however, had one big cargo ship sailing an overseas route, the Madrigal Integrity. For brevity, I shall no longer mention all the cargo shipping companies for they are long because they are many. I will just enumerate and describe the cargo companies which were in the more advanced and more important container liner operations (as distinguished from the general cargo ships and those that were in tramper operations). Only three companies without passenger operations were into cargo-container operations at the start of 1990 – Lorenzo Shipping, Escano Lines and Solid Shipping. Among these three, it was Lorenzo Shipping Corporation which was the biggest with a cargo-container fleet that can match the biggest cargo-container shipping companies that had passenger operations. In their fleet they had the Lorcon I, Lorcon IV, Lorcon V, Lorcon VI, Lorcon IX, Lorcon XI, Lorcon XII (the former liner Sweet Grace which was converted into a container ship), Dona Anita, Euney, Dadiangas Express and Cagayan de Oro Express. Escano Lines had in their fleet the Virgen de la Paz, Foxbat, Kiowa, La Lealtad, Greyhound, Harpoon, Squirrel, Terrier, Wolverine and two or three other freighters. However, only the first four were container liners (liners have fixed routes and schedules) while the rest were general cargo ships in tramping duties (let it be clarified they can substitute for the first four since practically speaking any general cargo ship can also carry container vans). Moreover, Escano Lines normally carry a mixed breakbulk cargo and container vans in their ships. Meanwhile, the Solid Shipping Lines only had the Solid Uno, Solid Dos and Solid Tres in their fleet. I am not sure if their Maligaya was still with them then. They were small because they were just a new shipping company then. However, one which was bigger than Solid Shipping and had container operations before, the Sea Transport Company, also did not make it to the 1980’s. They quit just before the end of the decade and sold their ships to other shipping companies. From about two dozen passenger liner companies at the start of 1980, we just had a total of seven passenger liner companies left at the start of 1990 and the seventh was the comebacking Madrigal Shipping Company. Because of the fall in the number of shipping operators and with a fast growing population and the economy reviving, the Philippines at the start of 1990 had a severe lack of inter-island passenger ships. In the international front, there was almost no longer ocean-going ships to speak of. Aboitiz Shipping Company and Eastern Shipping Company were practically the only Philippine shipping companies still trying to do foreign routes then but their number of ships might just add to half a dozen and those were much smaller than the ships of Philippine President Lines, Galleon Shipping Company and Maritime Company of the Philippines. That was how precipitous was our drop in shipping in a span of just ten years because of the crisis decade of the 1980’s. To think conditions in the other fronts were favorable for shipping as there were no budget airlines yet and so air fares were still high. There were also just a few intermodal buses then and there was a general dearth of bus units too. Because of such factors cited there were a lot of passengers for the ships. Maybe this is what some remember that liners then were full to to the brim and there were many well-wishers in ports during departures (and of course many fetchers too during arrivals). There were always tales of passengers being left behind because there were no more tickets left (I have seen that myself). And there were tales of overloading too, of course. The decade of the 1990’s was actually characterized by new great liners having a passenger capacity of over 2,000. Probably, that was the response to our lack of liners and liner shipping companies then. And that is the story of our shipping in the 1980’s which was reflected at the start of 1990. In a future article, I will discuss in detail our failure in cargo shipping in the same period. Abangan!